“Since 1988, when the greatest scare the world has seen got under way, hundreds of billions of pounds have been poured into academic research projects designed not to test the CO2 warming thesis but to take it as a given fact, and to use computer models to make its impacts seem as scary as possible. The new global ”carbon trading” market, already worth $126 billion a year, could soon be worth trillions. Governments, including our own, are calling for hundreds of billions more to be chucked into absurd ”carbon-saving” energy schemes, with the cost to be met by all of us in soaring taxes and energy bills. The chief defence offered by the warmists to all those revelations centred on the IPCC’s last 2007 report is that they were only a few marginal mistakes scattered through a vast, 3,000-page document. OK, they say, it might have been wrong to predict that the Himalayan glaciers would melt by 2035; that global warming was about to destroy 40 per cent of the Amazon rainforest and cut African crop yields by 50 per cent; that sea levels were rising dangerously; that hurricanes, droughts and other ”extreme weather events” were getting worse. These were a handful of isolated errors in a massive report; behind them the mighty edifice of global warming orthodoxy remains unscathed. The ”science is settled”, the ”consensus” is intact. All these alarms were given special prominence in the IPCC’s 2007 report and each of them has now been shown to be based, not on hard evidence, but on scare stories, derived not from proper scientists but from environmental activists. Those glaciers are not vanishing; the damage to the rainforest is not from climate change but logging and agriculture; African crop yields are more likely to increase than diminish; the modest rise in sea levels is slowing not accelerating; hurricane activity is lower than it was 60 years ago; droughts were more frequent in the past; there has been no increase in floods or heatwaves. What is staggering is the speed and the scale of the unravelling – assisted of course, just before Copenhagen, by ”Climategate”, the emails and computer codes leaked from East Anglia’s Climatic Research Unit. Their significance was the light they shone on the activities of a small group of British and US scientists at the heart of the IPCC, as they discussed ways of manipulating data to show the world warming faster than the evidence justified; fighting off legitimate requests for data from outside experts to hide their manipulations; and conspiring to silence their critics by excluding their work from scientific journals and the IPCC’s 2007 report itself. (Again, a devastating analysis of this story has just been published by Stephen Mosher and Tom Fuller in Climategate: The CRUtape Letters). It was in this newspaper that we first revealed how Pachauri has earned millions of pounds for his Delhi-based research institute Teri, and further details are still emerging of how he has parlayed his position into a worldwide business empire, including 17 lucrative contracts from the EU alone. But we should not expect the truth to break in too suddenly on this mass of vested interests. Too many people have too much at stake to allow the faith in man-made global warming, which has sustained them so long and which is today making so many of them rich, to be abandoned. The so-called investigations into Climategate and Dr Michael ”Hockey Stick” Mann seem like no more than empty establishment whitewashes. There is little reason to expect that the inquiry into the record of the IPCC and Dr Pachauri that is now being set up by the UN Environment Programme and the world’s politicians will be very different. Since 1988, when the greatest scare the world has seen got under way, hundreds of billions of pounds have been poured into academic research projects designed not to test the CO2 warming thesis but to take it as a given fact, and to use computer models to make its impacts seem as scary as possible. The new global ”carbon trading” market, already worth $126 billion a year, could soon be worth trillions. Governments, including our own, are calling for hundreds of billions more to be chucked into absurd ”carbon-saving” energy schemes, with the cost to be met by all of us in soaring taxes and energy bills. With all this mighty army of gullible politicians, dutiful officials, busy carbon traders, eager ”renewables” developers and compliant, funding-hungry academics standing to benefit from the greatest perversion of the principles of true science the world has ever seen, who are we to protest that their emperor has no clothes? (How apt that that fairy tale should have been written in Copenhagen.) 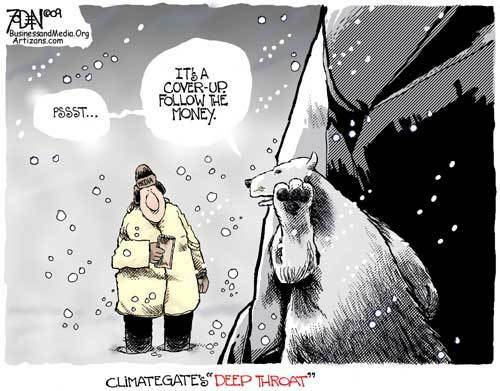 Let all that fluffy white ”global warming” continue to fall from the skies, while people shiver in homes that, increasingly, they will find they can no longer afford to heat. We have called into being a true Frankenstein’s monster. It will take a mighty long time to cut it down to size. This entry was posted on 28 februari, 2010 at 9:07 e m and is filed under Fri- och rättigheter, Miljö - Environment, USA, Yttrandefrihet. You can follow any responses to this entry through the RSS 2.0 feed. You can leave a response, or trackback from your own site.